Well, simple. Just tell me, in the blog comments section below (NOT on Twitter or Facebook), a Napa Valley winery you have always wanted to visit. Any winery at all. You don't have to give a reason. I will pick the winner randomly and then see if I can get that winery to give you a free tasting, for a little added bonus. Pro tip: Screaming Eagle isn't going to participate. Here is a list of the hotels where you can stay. 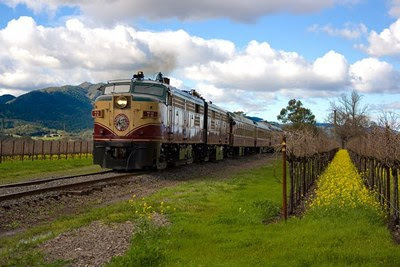 The Diablo Valley folks who are donating the package say they will work with the hotel and the Napa Valley Wine Train to get you the date of your choice. If you aren't the lucky winner, you can still buy the package here if you're one of the first 15 people to book it. It really is an amazing deal, even if you live in the Bay Area. Some of these hotel rooms go for under $100 total; the train ride goes for up to $358 total. Here's a list of good places to eat in Diablo Valley from Diablo Magazine. Deadline for entries is midnight PST on Sunday, July 5. Don't think, just enter. Tell me the Napa Valley Winery you've always wanted to visit, good luck, and choo choo! FYI: You might want to leave a clue to your identity, in case you win. If you're only "Sansa," anybody can claim to be you later on. Just saying. I'm going with Quintessa. Their tasting room -- oh, sorry "pavilion" -- looks amazing. V. Sattui. Funnily enough I don't know any of their regular wines; just their madeira, which I love. BV (Beaulieu Vineyard). So many, but if I had to choose I'd really want to get to there. Okay I have two, Qunitessa and now Odette winery. I drive past them everyday and haven't gone! EVH- Good call! Ridge. Their Lytton Springs was the trailhead of discovery for me.